Overheating and lack of rainfall in three of the world’s largest standing tropical rainforests led to a dramatic surge in the amount of carbon dioxide (CO2) released into the Earth’s atmosphere during the 2015 and 2016 El Nino events – the largest annual increases in at least 2,000 years, according to an analysis of data from NASA’s Orbiting Carbon Observatory (OCO-2). NASA Jet Propulsion Laboratory (JPL) researcher Junjie Liu was able to analyze the OCO-2 data, revealing that abnormally hot temperatures and drought conditions in South American and tropical forests in Africa and the Asia-Pacific led tropical forests to absorb much less and release much more CO2 into the atmosphere. That propelled global atmospheric carbon emissions to levels not seen for at least 2,000 years. Trees and other plant life are prone to dry out, die and decompose when abnormally hot, dry conditions persist, thereby releasing more CO2 into the atmosphere than they would normally. The process is exacerbated during El Nino years, which climate scientists expect will increase in intensity over the course of the 21st century. 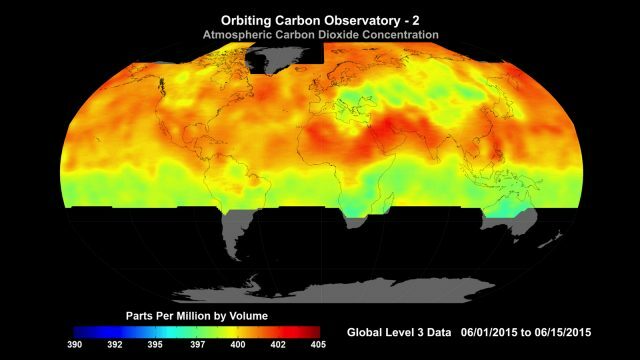 “In both 2015 and 2016, OCO-2 and the National Oceanic and Atmospheric Administration (NOAA) measured the largest annual increases in atmospheric carbon dioxide in at least 2,000 years,” JPL OCO-2 Deputy Project Scientist Annmarie Eldering was quoted as saying during a briefing, according to a Space.com news report. “In total, the three tropical land regions released at least 2.5 gigatons more of carbon into the atmosphere than they did in 2011,” an increase of about 50 percent, she said. Launched in 2014, OCO-2 is one of several NASA satellites that now provide what has been deemed a revolutionary new means for detecting changes in the amount of CO2 absorbed from the atmosphere by tropical forests. 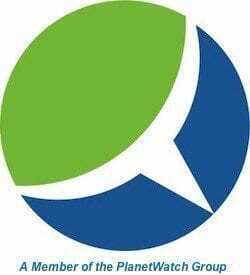 That, in turn, is enabling them to significantly enhance our understanding of the Earth’s carbon cycle and the effects of heat and drought on tropical rain forests. “The remoteness of these regions, their lack of field stations and the distorting effect of thunderstorms on land-based measurements of CO2 make the OCO-2 satellite an important and unique tool for monitoring the movement and increase of this greenhouse gas,” Space.com’s Doris Elin Salazar explains. Orbiting from pole to pole, OCO-2 takes about 100,000 direct, daily measurements of CO2 over the tropical rainforest regions of South America, Africa, Asia and surrounding Indonesia. It also measures the rate of photosynthesis by detecting the amount of chlorophyll in plant life. The measurements enable scientists to create models that calculate how much plant decomposition is taking place worldwide. The Amazon basin experienced its most severe drought in 30 years during the 2015-2016 El Niño event, Liu determined. In addition, precipitation data from satellite measurements revealed that tropical rainforest in Africa released more and absorbed less CO2. 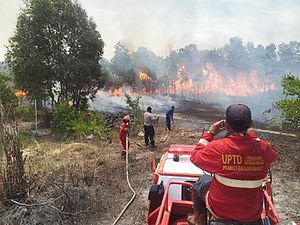 Heat from forest fires in Indonesia also contributed to the record-setting release of CO2 into the atmosphere. “The OCO-2 satellite allowed our team to quantify how the net exchange of carbon between land and atmosphere in each tropical region was affected by the 2015-2016 El Niño,” Liu explained.